This interview took place on: 3/2/03. Jesus freak Hideout: How did the signing to Columbia Records come about? And why the delay in the release? 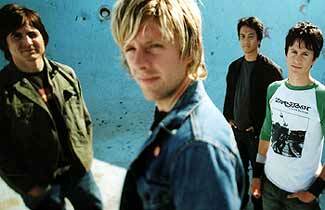 Jon Foreman: Well, that's a good question! The best way to explain it is Sony is a big battleship of a company. It takes a long time to turn it around. It's like parallel parking a Buick. It just takes a little bit longer. But how did we get signed to Columbia? We did a bunch of concerts, basically, for all of these industry guys and they seemed like the best fit for us. John: Really? Cause the album was originally supposed to come out in October, and it was finished... Yeah, I mean a lot of these songs I wrote like three years ago. 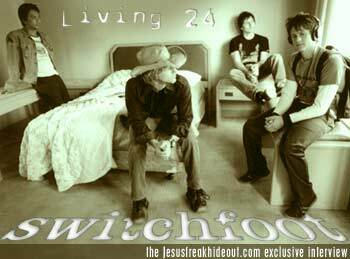 "24" was written when I was twenty-four. I'm twenty-six now. JFH: Are you guys already thinking about another record? Jon: He's been a friend of mine for a long time. We've known him forever. He called me from the top of this L.A. office building - like the tallest building in L.A. He was a "suit", basically, wearing his tie everyday to work for a week or so. He quit because he couldn't do it. He's like "I gotta get back to music!" He called me and he's like, "Hey Jon! Do you still want a keyboard player?" So I said, "Yeah! Let's do it!" JFH: How has he contributed to your current sound? Jon: I feel like Jerome is a great team player. I mean the same thing where live he just kind of fills in, is the same thing on the album. He's just a wonderful guy to have around. I just feel like he's got really good ideas - he adds them all the time. JFH: The cover of The Beautiful Letdown is really cool. Where was that taken and who's guitar is that? Jon: The guitar is my guitar. I bought it at a pawn shop in like North Dakota for thirty bones and the original idea was we were going to break it in half and put it at the bottom of the pool. Well, actually, we were going to light it on fire, but the place wouldn't let us light things on fire, so we were going to break it in half. But then I got too attached to it. As I was playing it, I was like "I can't break this in half!" So we ended up just throwing it at the bottom of the pool. It was in North L.A. Probably North Hollywood. I don't know exactly the location. It was a sketchy hotel where people rented rooms for months, y'know? It was a weird place, but it had a cool looking pool! JFH: Can you tell us a little more about the song "24"? JFH: Why was the song "Monday [Comes Around]" cut from the record? Jon: Um... I love that song, but it just didn't fit with the album. We've cut a lot of songs from different albums just depending on whether they fit or not. That was a song that just definitely wasn't happening. Just in the vibe of the whole album. So... yeah, no hard feelings! We're still good friends! *laughs* John: No no, I like the song too, but I actually felt that way when I heard it. Yeah. I could tell it didn't fit... Yeah. But I like that song, it just doesn't really fit with the record. We put it out as a b-side on our 7 inch. So it's available, just not on the album. JFH: Why the remake of "Dare You to Move"? Jon: We just felt like that song hadn't lived its shelf life yet. Being signed to Columbia, there's a lot of people who haven't heard that song that will hear it on the new Columbia release. See, that song for us is a defining song and we want people who are just being first introduced to our sound to have that as a part of the experience. Also, after having played it a couple years live, I feel like we've got a better grip of how we want it to be on a record. I wish we had the chance with a couple other songs but that was one that everyone agreed we should do that one again. JFH: What's the story behind "On Fire"? Jon: I wrote that with a friend of mine in like five minutes. He was late to catch a train. He's a friend of mine from Canada, he was in L.A. for a couple of weeks. He road the train down to my house to hang out for a day. And we wrote two songs the night before for his project, and actually, this was for his project, too, but we liked it so much we wanted to use it for ours. It was like half an hour before he had to catch his train and we just threw it down and then ran down to the train station and got him on. JFH: What's the status with Switchfootage? Jon: It's been delayed for a long time now and it does exist. We just had our first feature-length documentary come out which is called "Everything to Lose." It's done by E.E. Kennedy, she's a film student at USC. And that's not going to be released to the public, it's going to be tailored to Switchfootage and then that's what everyone's going to see. Hopefully Spring or Summer. But we have all the footage, it's just a matter of narrowing it down now. It's going to come with a short called "Red Tape." It's kinda cool, you'll like it! Is it going to be on just video or DVD, too? It should be on DVD and video, yeah! JFH: What scripture has had the greatest impact on your life? Jon: Psalm 103, I'd say. Why? It's a very inclusive psalm. It talks about many different states of mind that we go through as humanity. And for me, it encourages me to keep my head on and focus on what matters. JFH: What's your favorite song off of The Beautiful Letdown? Jon: I like "24." Yeah, that's pretty fun. JFH: As more established musicians, what kind of advice do you have for new Christian musicians starting out? Jon: Well, that's a complex question... I think from where I'm coming from in my faith, that's an entirely different question than the musician aspect of it, y'know? I think, first of all, to keep your head straight and keep your eyes focused on what matters. That advice I give to everyone. To the musicians, I'd probably say to make sure you enjoy that music is a beautiful and incredible gift to be given. I think so many people, myself included, you're always looking foward to the next big thing, the next big thing. But the next big thing, who knows if it's going to be better than what we're doing now? So take advantage of the fact that you have breath right now. You don't know that you're going to have it tomorrow. JFH: On Friday, you met our indie guy, Blake. He's been working with us for about two or three years but we actually haven't even met him yet. What is he like? Jon: *laughs* He's cool! John: *laughs* He's cool? Yeah! He's totally cool! What does he look like? *laughs* Um... I can't remember. I think he had curly hair? I can't remember. I'd know if I saw him. I think he's taller than I am, dark hair. Darker, maybe like, that color hair? *points to Kevin's hair* Yeah, we're hoping to finally meet him this summer! Yeah, he's a good guy! He told me he was working with you guys... Wait! It was in Virginia Beach? I don't think so... Was it last night? Friday night, wherever Friday night was... Friday night was um... South Carolina! I met him outside the club, I remember that. Kevin: Was there snow down there? No, no. But it's been getting colder and colder as we go up. Jon: Well, that again, is a tough question... I had the chance to meet Bono (of U2). I'd have to say they're one of my heroes, for sure. JFH: How about advice for newlyweds? Jon: Aw man, love each other! Your pride is such a venomous animal and it pops up its head everywhere. You can never kill it, but you can be aware of it and you can beat it down the best you can. That's the most dangerous thing when it comes to love. John: Cool, yeah, cause we hear a lot of discouraging things about marriage. Be afraid! Be fearfully and wonderfully made, y'know? Be ready to take both ends of that. JFH: And the hair? Is that like an Owen Wilson homage thing? Jon: Live well! We'll see you around!